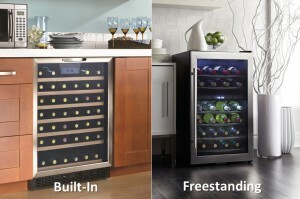 Are you in the market for a new wine, beverage or bar refrigerator? We have noticed that a lot of Danby customers are unsure of the real differences between freestanding and built-in and how it affects your purchase decision. We want to make sure you are making the right choice! Our built-in units include all Silhouette branded appliances and our freestanding units include all Danby mini refrigerators, wine coolers and beverage centres. 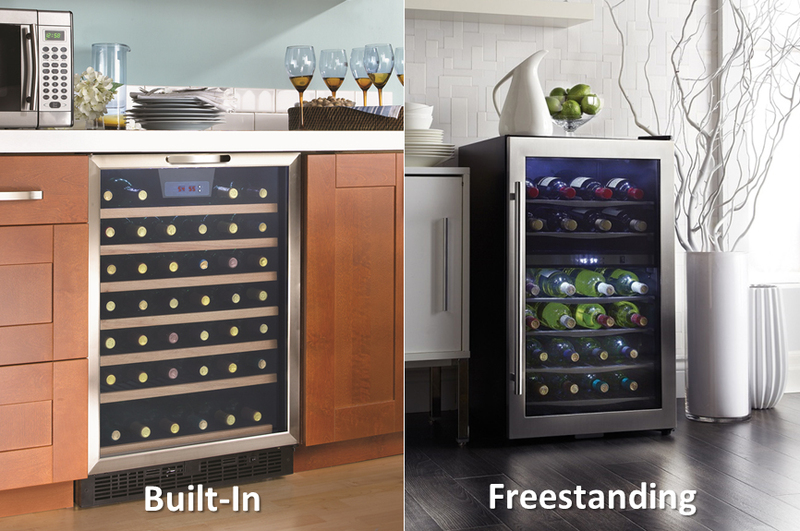 So, what are the key differences between a freestanding and built-in wine, beverage or bar refrigerator? Vent placement – In order to build in your wine, beverage or bar refrigerator under a counter, you need proper ventilation to avoid over- heating. A unit with front ventilation is considered a built-in unit, whereas a unit with side or rear ventilation requires sufficient space on the sides and rear for heat to dissipate, thus considered a freestanding refrigerator. Dimensions of the unit – most built-in models are designed to the same depth as adjacent kitchen counters and other fixtures so that the unit is flush with your cabinetry. Freestanding unites may be at odd sizes and you will notice they do not fit perfectly under a counter top. Allow 5 inches of space between the back of the unit and the wall, while also allowing at least 2-5 inches, depending on your model, for any adjacent wall. Avoid moist and damp areas. Too much moisture will cause frost to form quickly on the evaporator, and your unit will have to be defrosted more frequently. Recommended that you do not install the unit directly beside a wall so that the door is able to have a 90 degree swing. Give yourself at least 2 inches at the back of the unit to ensure that you have room for the plug. Other than our outdoor-rated Silhouette refrigerator, Danby appliances are not meant to be kept outside. Doing so will void your warranty. Cleaning instructions vary depending on your model – please refer to the owner’s manual for proper cleaning procedure. Check out David talk about the differences between a freestanding and a built-in unit on our YouTube page here! I just took delivery of a set of BergHOFF pots and pans from Jim’s offer and was shocked with how well they’re made. They’re heavy with a very thick base and will work on the electric cooktop I have at the cottage now and the induction cooktop we’re planning to replace it with in the future. And they look great. Even better is the current deal he has for his YPO/WPO friends and family. Thanks Jim.